Africa’s most populous country is also home to some of the continent’s finest hotels. In particular, Lagos, the country’s capital city, is the largest business hub as well as being a popular tourist destination. This remarkable coastal city, which shares its name with a city in Portugal, is a major metropolitan with a population of 15 million people – and a fascinating blend of influences. Traditional African cultures, blended with Arabic and Indian inspiration, have shaped a vibrant, friendly and energetic society. In an economy driven by the export of natural resources, Nigeria has also become an African forerunner in technology and development. Lagos itself, situated on a lagoon, is a city split into several parts – a mainland section of the city in addition to two large islands. Tourists are able to enjoy sights like the renowned Oyingbo Market, and every year in April, Lagos hosts an exuberant, colourful carnival which is modelled after its famed cousin in Rio. Nigeria is an enigma: rich in natural resources and ancient tradition yet driven by a desire to match the best modernity the world has to offer. It is in this spirit that Tsogo Sun Hotels offers guests fine accommodation in the heart of Nigeria. 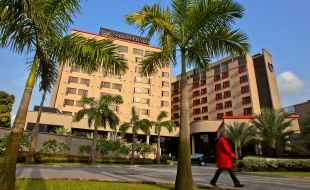 Our recommended hotel is the Southern Sun Ikoyi. It is the perfect destination for tourists and corporate visits. The hotel is in a relaxing upmarket area and offers international standards with Nigerian charm.